One of the reasons I love being an American is fresh, seasonal apple cider. I grew up in Michigan, where we take our apples seriously, and I don’t think there’s a single child in that whole state who didn’t love going to the cider mill for spiced, steaming hot cider and a fresh cider donut in the crisp days of October. One of the great (and few) sadnesses of living in California for so many years was the lack of really good apple cider. When we moved to rural New England, I was happy to have my cider back. Now that we’re in Oregon, I have a new wealth of apple cultivars, and a few, precious repositories of cider. You’d think I’d be satisfied with the seasonal goodness of that fresh cider, but I’m greedy, so I freeze what I can. This year, I decided to try to make jelly out of the cider that could be used throughout the winter as an appetizer with cheeses and walnuts, a glaze for baked apple desserts and as layers in other baked goods, and of course, on toast. Making jelly can be easy if you use commercial pectin, or a delicious pain if you don’t. I haven’t had the time to experiment with pectin-free apple cider jelly, but I do have a recipe that involves cooking apples, filtering twice, macerating overnight, adding cider, and blending it all together. Sounds fantastic, but yeah. One problem with the Sure-Jell recipe is that it is a freezer jam, which limits gift-giving opportunities and takes up freezer space. Another is the sugar content. The Sure-Jell recipe uses 3 cups juice to 5 cups sugar. It will make more jelly, but achingly sweet stuff compared to the Pomona recipe, which uses 4 cups juice to anywhere from 3/4 to 2 cups sugar. My aim is to keep the flavor as close to natural apple cider, with all its tart poetry, as possible. Apples contain quite a bit of pectin naturally, so you don’t need to mess with them too much. Even so, these recipes contain lemon juice, probably since they both call for apple juice instead of apple cider, which is an altered product with sugar and what-not. I decided to leave in the lemon juice to combat the sugar, even though both shift the flavor a bit. One needs to boil the cider to set the pectin, but boiling is the real problem when you’re trying to keep the flavor cidery. Even pasteurization, a process that heats a product to kill microorganisms up to a certain temperature that’s less than boiling, will give a slightly “cooked” flavor to the cider. So I recommend getting your juice up to a boil very quickly. The processing time, 5 minutes in a boiling water canner, is necessary if you plan to store your jelly on the shelf or give it away for holiday gifts in December. If you’re planning to just eat it quickly, don’t process it because the flavor will be fresher. Just keep it in the refrigerator. Makes 5 half-pints with a bit left over for sampling. If you’re planning to spice your cider, start the day before canning. 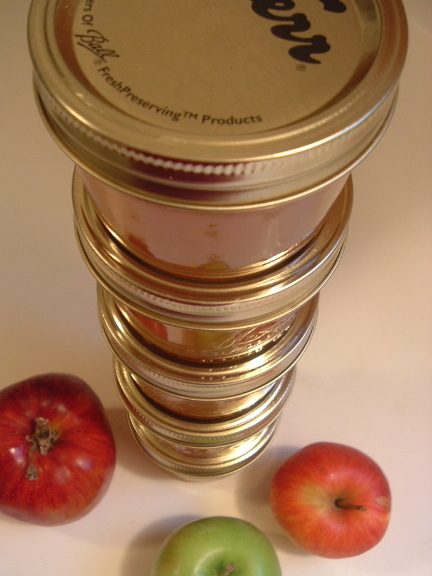 Measure out your cider and place in a jar or bowl that can be covered. Add cinnamon stick. Place the other spices in a little cheesecloth square that can be tied shut with string, then add to the cider. (OK, if you’re lazy like me, just add the spices without the cheese cloth and strain the juice later.) Refrigerate cider with spices overnight. Before beginning your jelly, wash your jars and sterilize them by boiling them in your canner for 5 minutes. Wash your new lids and your rings. Keep the lids and rings in water at a simmer (180 degrees), don’t boil them, in a small pot on the stove. Filter out the spices from your cider and pour into a medium-sized pot. Add calcium water and lemon juice to cider in the medium pot. Bring cider up to a boil as quickly as possible. As cider is heating, mix together the pectin and the sugar in a small bowl. Skim foam that rises to the surface of the cider. When the cider comes to a boil, add in the sugar/pectin mix, stirring constantly for one minute, to melt the pectin. If you don’t stir constantly, it will lump. Remove from heat, fill hot jars, leaving a quarter-inch headspace, wipe rims, cover with lids and rings, and process for five minutes in a boiling water canner. This recipe makes a firm jelly that will hold its shape. You can unmold it from the jar by running the jar under hot water for a few seconds if you’d like to serve it at a party with cheese and crackers. Enjoy fall in its finest, jellied form. * If you live in Eugene, you can find this at Sundance, Market of Choice, and Down to Earth throughout the year. This recipe won the Apple Cider challenge for the weekly Root Source Challenge over at Cookthink. Yay! Just wanted to say I made that panzella from your column last with the last of my garden tomatoes for the duck game yesterday and it was a huuuuge hit! It’ll definitely be a keeper! Thanks for letting me know, Andrea! I’m glad it worked for you. I really do love panzanella. Thanks for the recipe, I’ve never used the Pomona stuff before, so it will be fun to give it a try. The brakes are going on the bike this week if all goes well. You found actual cider in(around) Eugene? I’ve been in withdrawal since Tom’s closed. 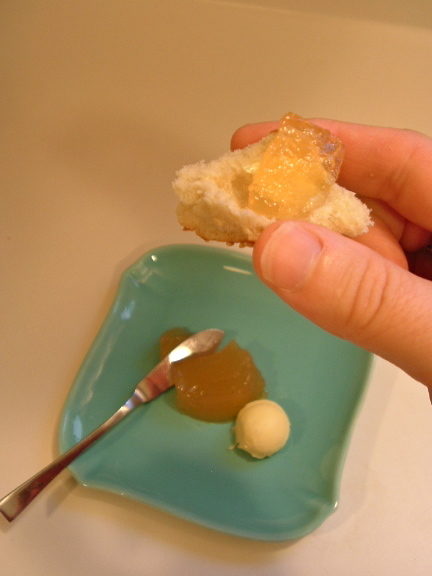 PrimitiveCinema, the Pomona pectin is great for low-sugar spreads. I use it all the time. The texture will be a bit different than regular jam, but it sets up beautifully and you can really taste the fruit in the final product. JillyJill, not Eugene, sadly. I bought it at the red barn market stand on Hwy 34 between Albany and Corvallis. They’re my source, and the cider is excellent — it’s from Salem and it is UV-treated. I also buy cider from Detering’s Orchard. They freeze some, so you can buy gallons well into spring. Last year, the Market of Choice on Franklin had big glass jugs of cider that were decent, but I think they were pasteurized, so they weren’t as tasty. The MoC on 29th didn’t carry them. Thank you ever so much! I really would like to try making apple cider jelly. Was just searching the web and ran accross your receipe. We were introduced last year to the idea of cider jelly. Ours, though, is nothing but cider. you just boil it down at about a 9 to 1 ratio (one gallon makes just nearly two 8-oz jars of jelly). boil it for a few hours… you can add mulling spices if you like (I use a tea infuser for easy removal). then you jar it up. it’s great on crackers & toast AND when you have a hankering for hot cider you just put a spoonful or two in a mug of hot water. plus there are all sorts of old New England recipes that use this stuff… either boiled cider (about a 7:1 ratio on the boiling) or the jelly… because people could make it on their farms. it was for sweetening everything from porridge to apple butter to fancy baked goods, and also was considered a healthy thing in winter (probably helped prevent scurvy or something during times when you can’t get anything fresh for months on end. it takes a few hours to boil down each gallon, but it’s pretty amazing stuff. the natural pectin makes it jell right up when you’ve got it boiled enough.